STOCKTON - Lodi's Michael Wendt took advantage of an early yellow flag to race to a well-earned victory in the Firecracker 150 in front of an estimated 4,000 spectators at the Stockton 99 Speedway on Sunday evening. Seaside's Dave Byrd led the opening 29 laps until a caution flag allowed Wendt to pass him on the restart. Wendt built that margin to nearly half a lap, winning by 6 seconds. Modesto's Jeff Belletto, the season points leader, finished third. Manteca's Matt Anderson held off James Reichmuth at the finish line to grab his first career victory in the B-4 division and end Reichmuth's five-race win streak. Anderson, 15, started the race on the front row while Reichmuth, also from Manteca, dropped from the second row to last place as a result of apparent car trouble before battling all the way back to second place with three laps to go. "I knew (Reichmuth) was moving up," said Anderson, a Manteca High sophomore. "He's a good driver - you can see why he's first place in (season) points." Anderson, a third generation driver at the track, said, "I have a good crew chief - my dad." He follows in the footsteps of his father, Pete Anderson Jr., and grandfather, Pete Anderson Sr.
Stockton's Jeremy Tucker survived four yellow flags in the Bomber division to win the 30-lap event under a caution over Stockton's Andy Rumsey to stretch his season points lead. Turlock's Wes Miller also extended his season points lead by winning the Grand American Modifieds by nearly a straightaway over Sacramento's Jason Philpot. 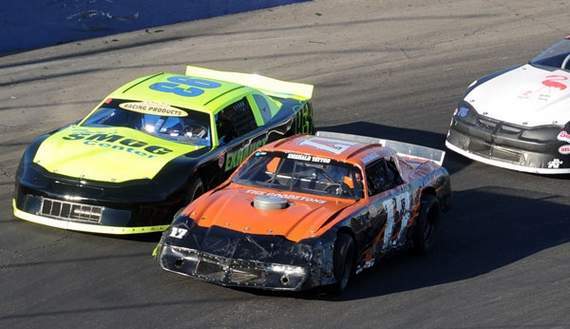 Modesto's Garland Tyler was awarded the Super Stocks main-event win after officials determined Atwater's Jason Aguirre had bumped Tyler to get past him. Tyler holds the points lead ahead of Stockton's Rich Harper. "The official said he saw contact and I kind of saw it that way, too," Tyler said. Reichmuth took the checkered flag in the B-4 trophy dash, Tucker won the Bomber division dash, Miller took first in the Modifieds, while Manteca's Chad Holman won in the Super Stocks. Track officials honored Thomas Hobbs, a former pit crewman at the track from Manteca who passed away from cancer June 19, with a memorial lap. Byrd circled while holding a checkered flag handed to him by Hobbs' daughter, Lauren. The track next hosts the USAC Open Wheel event July 9. On Sunday, July 3rd, the NASCAR Whelen All American Racing Series ignited the smoldering racing surface in the annual Firecracker 150, brought to you by California Welding Supply Co. The Independence Day Weekend’s grand finale went off with the Western Late Models in 150 Laps of explosive action, which culminated in one of the biggest upsets of the year. Also, the Grand American Modifieds returned to action with the Super Stocks, Bombers, Basically-4- Cylinders and, of course, the Annual Fireworks Spectacular Show. The 4000-plus fans in the stands thoroughly enjoyed a great evening of fireworks both on the track and above in the beautiful summer sky. The Basically-4-Cylinders rolled onto the high-banks, twelve deep. Tonight, a new chapter would be written in an old book when 15-year old, up-and-coming star and third generation driver from Manteca, Matt Anderson (5), battled his way to the checkers for his career-first win. Kelle Bobbitt (61) of Stockton, with Tommy Wood (28) of Hughson alongside, paced the field around to greet the green. Bobbitt beat the field down into turn one to capture the early lead only to be slowed on the next go-around when the #7 of Charles Kundert, Jr. came to rest low on the track in turn one, bringing with him the immediate first yellow of the race. On the lap 1 restart, the #747 of Chris Boone got the great bite high and outside and wrestled the lead away from Bobbitt. Boone would enjoy the rarified air out front for the next eleven circuits until lap 12 when, in turn one, the #9 of Dave Kong spun low while the #51 of Nick Rogers spun high, and the second yellow of the race broke the silence of the night sky. On the restart, Boone, once again, showed his strength as he jumped out to retain his lead. However, on lap 23, Matt Anderson had plans of his own when he rolled by the leader on the outside coming off two. Once there, Anderson would not be denied his career-first victory, despite the massive aggression going on behind him, which came in the form of Points Leader Joseph Reichmuth (6) of Manteca. Anderson’s very popular win snapped Reichmuth’s five-race winning streak. “This is just amazing, I’m proud to be here,” said the polite young driver from Manteca, “I knew Joseph (Reichmuth) was there. He’s a great driver and it’s easy to see why he’s leading the points.” Reichmuth, after mechanical issues on lap 1 forced him to drop back to the tail-end of the field, would have to settle for a rare second place on this night. Boone slipped back, if only slightly, to finish a very solid and impressive run on the podium in third. Bobbitt, the early leader, managed to hold on to a top five by finishing fourth, while Mark Jacke (4x) of French Camp rounded out the top five. Next up, the fan-favorite Bomber Division roared onto the hot asphalt for their 30 lap Main Event. No surprise winner here when Points Leader Jeremy Tucker (351) of Stockton took it to the checkers for his third win of the year. As if this race needed any added intensity, Tyler Guzman (93x) of Ceres nabbed the pole with Stockton’s own Bobby Simpson (819t) glued to his right-side numbers. Simpson jumped out to enjoy the early lead, but his enjoyment would be short-lived when, on lap 6, the #043 of Stockton’s Phillip Guerrero looped it low in turn two, which brought with it the first yellow of the race. On the ensuing restart, an immediate yellow came out when Guzman and Mike Massone (007) of Stockton made contact out of turn four, which sent both cars spinning down the frontstretch past the flagstand and, of course, the flagman could not help but notice as he promptly sent the yellow flying. On the lap 7 restart, Jeremy Tucker, as he often does, got back to the gas just quick enough to jump out into the lead where, once there, he would bask in the glory of that much-coveted real estate out front and take it all the way through to the checkers for his third win of the year. And in doing so, he would increase his number one status. “I’m at a loss for words, but I would like to thank everyone, including the fans for being here tonight,” said the excited Tucker. Stockton’s Andy Rumsey (033), back to the track after an unfortunate accident a month ago, showed his usual prowess in finishing second. Mike Massone, after the earlier altercation, put together a beautiful rally by coming back through the field and finishing on the podium in third. Dave Tucker (350) of the Tucker Clan, managed another strong finish in fourth with Bobby Simpson, falling off the pace just a bit, but still bringing her home in fifth. In the Grand American Modified Division, car-counts continue to impress and so does the competition. However, on this night, Points Leader and Driving Sensation, Wes Miller (57) of Turlock, left the biggest impression by winning his third of the year over a star-studded field. This one got underway with Nick Lyons (11x) of Lincoln sitting on pole and Mindy McCord (26) of Billings, MT high and tight. No sooner had this one took to the green than did the yellow flag take to the night sky when, on lap 1, chaos broke out down the frontstretch as several drivers decided to fight over the same patch of asphalt. Unfortunately for the field, on the lap 1 restart, Wes Miller rose to the top and began to stretch it out until lap 4, when McCord’s #26 racer climbed on top of the #3 of Stockton’s Dave Strickland, which brought with it the second quick yellow of the night. On the restart, Miller, once again, laid claim to that golden portion of property out front where he would take up residence, mostly unchallenged, until the checkered flags were waving above him as he crossed the finishline for his third victory of this Season. Sacramento’s Jason Philpot (15a), always a threat wherever he races, had another strong run finishing second. Scott Winter’s (24) of Tracy, another Superstar in the world of Modified Racing, brought her home on the podium in third with Lyons, falling off just a bit, finishing up in fourth. Santa Rosa’s Andy Vanderveer (49) finished with another solid run in fifth. The Premier Division Super Stocks always produce great racing for the crowd. Tonight there would be little difference except for the splash of controversy that handed the eventual win to the Points Leader from Modesto, Garland Tyler (73), his second on the year. Tyler got the lucky draw which inverted him to P1 on the starting grid. Lodi’s Matt Wendt (1) flanked him to the right to make up the front row. At the drop of the green, Tyler got the great jump which awarded him the holeshot going off into turn one where he would enjoy the clean air at his face over the next twelve laps until lap 12, when half the field was catastrophically sucked into the blackhole, which is turn three, due to some over-aggressive driving habits displayed on this night. The race was brought to a halt first by a yellow, then a red, for the lengthy cleanup of the massive carnage. When the dust settled and business got back to the race at hand, the green flag was again visible on the lap 12 restart, and Tyler took full advantage of the situation by assuming the point, which he had held all night, but this time he had company in the form of Atwater’s Jason Aguirre (45), who gnawed and chewed all over the bumper of the #73 until lap 25, when Aguirre decided to take matters into his own hands by applying a bumper to the quarter-panel of Tyler coming off two and managed to slip by low while Tyler was trying to regain his composure. From that point, Aguirre distanced himself from the field and sped off to the checkers for an apparent third win of the year. Unfortunately for Aguirre, the jury didn’t take long to convict him of rough and unusual punishment to Tyler’s rear bumper and Aguirre was set back a spot in the finishing order, handing the win over to Tyler, whom, by the way, graciously accepted his new-found inheritance. “There was some interesting racing tonight, a little rougher than it should have been,” said the young Modesto driver, then added, “I guess the officials kind of felt that way too. I’ll take the win, I don’t like it like that, but I’ll take it.” Of course, Aguirre would have to settle for an extremely disappointing second while Lodi’s Aaron Shankel (47), most likely not disappointed, brought home the bacon in a Season-high podium finish in third. Tony Schmitz (5x) from parts unknown, welcomed himself back to the Speedway with a very impressive finish in fourth. Matt Wendt (1), fell off the pace if only slightly, but still managed a fifth-place run. The much-anticipated Firecracker 150 for the Western Late Models took on a different look, but in the end, Lodi’s Michael Wendt (2) would raise both arms to the Heavens in celebration of his impressive, dominating Victory, his second of the year. After the draw for position on Saturday, it was quite clear where everyone would start in this one. Stockton’s Joey Stearns (8) pulled the lucky American Flag with the number one attached while Seaside’s “Top Twenty-Five West Coast Drivers of All Time” Dave Byrd (78) collected the number two flag. And so it was, the green flag went flying and Byrd got that great jump on the outside as he often does and went flying himself, off into turn one and to the lead where he began to chew away at the asphalt until he found himself a full straightaway ahead of his nearest competitor. Unfortunately, all that distance would be erased on lap 29 when Larry Tankersley (96) of Stockton hit the wall a ton up in turn two and brought out the first yellow of the race. A yellow Dave Byrd, most assuredly, still regrets. On the lap 32 restart, Michael Wendt (2) grabbed that certain huge hunk of forward bite and we had a new sheriff in town. Once out front, despite a few more caution periods that would test his will, Wendt showed his strength by putting more and more asphalt between him and his closest contender, lap after powerful lap until, finally, there was nothing left to race for but second place as the #2 car crossed beneath the checkers over a half-lap ahead of the pack for his second, and most impressive, win of the Season. “My dad kept telling me to save my tires, save my tires and don’t get too involved in lapped traffic,” said the well-mannered Wendt, “And that’s what I did and it paid off.” Dave Byrd would hold on to finish a distant second, despite the severe battle waged on the entire rear bumper of his car by third-place finisher and Points Leader Jeff Belletto (12x) of Modesto. 2006 Track Champ, Guy Guibor (61) of Manteca, brought her home in a very respectful fourth while third generation driver and 2009 Track Champ, Justin Philpott (05) of Tracy, rounded out the top five. As a precursor to the Firecracker 150, on Saturday, July 2nd, Kids Night & City of Modesto Night at the Speedway featured the NCMA Sprint Cars, Vintage Hard Tops, Mini Trucks, Legends of the Pacific, Pro-4 Modifieds and the Mini Cups. In the Mini Cup Division, Points Leader Bryce Napier (03) of Scotts Valley started P1 on the field and at the drop of the green, he would take it to the house in a wire to wire romp for his third Main Event win of the year, which, of course, extended his Season’s Points Lead. Stockton’s Chad Bindi (4) took top honors in the Mini Truck Division. In the Vintage Hard Tops, Santa Rosa’s Conrad Cavallero (2) notched another Victory, this time starting shotgun on the field. In the NCMA Sprints, Justin Kawahata (15) of Clovis started on pole and led the first couple laps before succumbing to the pressure applied by Denny Burrell (88) of Ripon on lap 3 when Burrell wrestled the lead away and took it to the checkers for the win. Of course, Burrell did not go without pressure applied to him, and that pressure came in the form of David Goodwill (3) of Napa. Goodwill got all he could out of his car, but in the end, Burrell was just too strong on this night taking the win in a well-contested battle. The Pro4 Modifieds were back in action and this one got underway with the #54 of Windsor’s Neo Nuno leading the way until lap 14 when Jake Tillman (34) of Cobb, working his way up through deep in the field, made a beautiful pass for the lead where, once out front, he gradually stepped away to the Victory. The Legends of the Pacific always show up ready to race, and this night was no exception. Stockton’s own Fred Clement (58) of the Clement Clan grabbed the early lead only to be overcome on lap 7 by too much Jessica Walker (21) of San Ramon. Walker took control of the top spot and over the next eighteen laps, she appeared superbly strong. Unfortunately for Jessica, on lap 26, Tracy Superstar, Jeremy Wood (20) found his way to her rear bumper and completed the pass for the lead where he took it the rest of the way to the stripe for the very popular win. Next Saturday, July 9th, don’t miss out on an open-wheelers delight when Stockton 99 Speedway presents USAC Open Wheel Night featuring the USAC Western Classic Racing Series Sprint Cars, USAC Western Midgets, Ford Focus Midgets, and the Jr Focus Midgets.